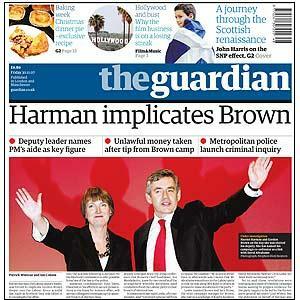 The Guardian, a British newspaper, has today launched the Guardian Open Platform. “What’s that?”, you may ask. It’s an open API for all the Guardian’s web content. More simply, it’s a way for anyone to freely use Guardian content and data for whatever they want. You may be wondering why on earth the paper would give its content away for free, given that it charges for it in paper form. Well, the answer is that the Guardian wants to be an all-pervasive source of knowledge on the web, rather than just a site that people have to go to to get that content. Using the new system, anyone will be able to integrate Guardian data into web applications. The Guardian, in return, gets ad revenues. For the moment, it’s limited to just 5000 queries a day, and it’s all still in beta, but with any luck the Guardian can use their strong trusted position to become the default content provider for many sites on the net. 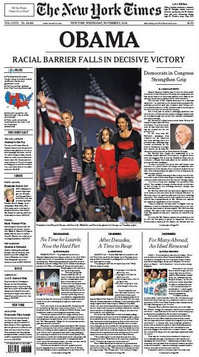 Yesterday’s American newspapers, all of which carried various combinations of the words “Obama” and “wins” and “change” on their covers, are selling on eBay for vast sums today thanks to the whole incredible level of excitement surrounding the election of America’s first ever president. I’ve just returned from a delightful morning with Yahoo!, who gave me a preview of all the exciting stuff they’ve got planned for 2009. They’ve innovating in several key areas, but the push is on making the user experience more social and more open.